2015 New Holland T7.210 4wd tractor, 18X6 40 KPH full Powershift transmission, 540/1,000 PTO, fender-mounted EDC and PTO controls, 112" bar axles, four electronic rear remotes, low pressure return, joystick with rocker switch, electronic radar, full factory auto guidance complete, loader/engine side frames, 10 front weights with tow hitch/hook, deluxe cab with heater and AC, halogen worklights, Class 4 front axle, mechanical cab suspension, CAT III quick hitch, rear window wiper, 320/85R38 R1W front tires, 380/90R50 R1W rear tires with matching duals (front-rear tires are all Michelin AgriBib radial tires), 992 hours. 4.5% fix rate financing available for up to 60 months. Extended warranty protection plan available for purchase. 2016 New Holland Boomer 46D 4wd 45 hp compact tractor, cab with heat/AC and radio, cold weather package, two rear remote valves, CVT transmission, R4 industrial front & rear tires, suspension seat, 3 pt. with top link, mid-mount PTO, external cab mirrors, tilt/telescopic steering, 250TL Q-tach loader, 72" skid steer Q-tach bucket, joystick loader valve, front bumper grille guard, 218 one-owner hours. Loader S.N. : YGM048321. 1982 White 2-110 4wd tractor, 3 pt. hitch, two rear remote valves, 18.4X28 10-ply rear tires @ 90%, 16.9X24 front tires, 540/1,000 PTO, 6,057 actual one-owner hours. Good, clean, sharp tractor. 2008 New Holland T4030F narrow tractor, 3.2L 4 cylinder diesel engine, 76 gross engine horsepower, 62 PTO horsepower, 2 wheel drive, 16 speed transmission with mechanical forward/reverse shuttle, differential lock, open station platform with folding ROPS, 380/70R20 R1 Goodyear rear tires @ 80%, 750X16 3-rib front tires, six front weights, hand and foot throttle, mechanical suspension seat, telescopic steering, 3 rear remote valves, 3 pt. hitch with top link, has hydraulic cylinder on left hand 3 pt. lift arm, radio, horizontal exhaust, 540/1,000 rear PTO. One owner, 966 actual hours; like new condition. 2001 New Holland TC35D compact tractor with 3-cylinder, 35 hp diesel engine, 4wd with SuperSteer, front and rear turf tires, folding ROPS, hydrostatic drive with four ranges, differential lock, cruise control, swivel seat, 540 rpm rear PTO, 3 pt. with top link, one set rear remote couplers, New Holland 17LA loader with 72" bucket (bucket predrilled for bolt-on cutting edge), 516 actual hours. Clean, one owner, very sharp. 2015 Kubota F3990 39 hp 4 cylinder diesel engine, 4wd, front mount 72" mower deck, hydraulic lift, ROPS with hard cab and heater, hydrostatic drive, 711 hours. Serviced through shop. 1973 John Deere 4230 2wd diesel tractor, 3 pt. with top link, cab with heat & air, 1000X16 front tires, 18.4XR38 rear tires, 540/1,000 PTO, Quad Range 8 speed transmission, 8,387 hours. Serviced through shop. 2007 New Holland TC31DA 4wd compact tractor with SuperSteer front axle, R4 industrial tires, front grille/brush guard, folding ROPS, 3 pt. hitch with top link (top link not show in photos), 540 rear PTO, 2,000 RPM mid PTO, swivel seat, tilt/telescoping steering wheel, three-range hydrostatic transmission, 108 actual hours. Serviced through shop. We have available a New Holland 914A 60" mid-mount mower deck available (tag #: 64115). Deck is in like-new condition. 1979 Ford 9700 2wd tractor, factory cab, new interior kit, newer 18.4XR38 rear tires, 1000X16 front tires, two hydraulic remote valves, 3 pt. hitch, 540/1,000 PTO, Dual Power transmission, A/C not working. Showing 2,199.7 hours. 1980 Ford 6700 2wd tractor, open station, 16X4 Dual Power transmission, new Firestone 18.4X34 rear tires, 1000X16 front tires, load monitor, two sets rear remote couplers, differential lock, 3 pt. hitch, front weight bracket, 7,455 hours. Serviced through shop. 1978 Ford 7700 2wd tractor, 4 cylinder diesel engine, 18.4X34 rear tires, 540/1,000 PTO, 1000X16 front tires, front weights, 3 pt. with top link, 2 rear remote valves, 16 speed transmission with dual power, cab with heat and air (AC not working), 7,333 original one-owner hours, original paint (could use repaint). 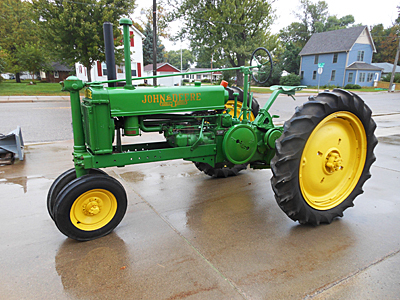 1966 John Deere 2510 tractor with 3.0L 4 cylinder 55 hp gas engine, wide front axle, 8 speed Power Shift transmission, 540/1,000 PTO, 750X16 front tires, 15.5X38 rear tires @ 90%, one rear hydraulic remote, hydraulic wet disc brakes, 3 pt. with factory top link (top link not shown in photos), dfferential lock, hydrostatic power steering, showing 1,732 hours. Sharp, clean tractor. One of 513 JD 2510 tractors built with gas engine and Power Shift transmission. 1971 IH Farmall 656 2wd hydrostatic drive tractor, gas engine, factory wide front axle, two point hitch with 3 pt. conversion, Goodyear 15.5X38 rear tires, 9.5LX15 front tires, two rear remote valves, 540 PTO, two-owner local trade-in tractor. Original paint. Serviced through shop. Showing 7,190 hours on working tach. 1967 Minneapolis Moline M670 Super tractor, gas engine, two rear remote valves, 3 point hitch with original top link, 5 speed transmission with Ampli-Torque, 540 PTO, matching 18.4R34 Goodyear Ultra Grip rear tires @ 70% tread, showing 4,677 hours. Very clean, straight tractor; original paint. Serviced through shop. 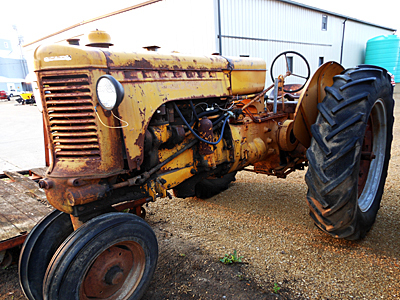 1979 Ford 1600 2wd tractor, 1.3L two-cylinder 23 hp Shibaura diesel engine, 540 PTO, 3 pt. arms, 5.00-15 front tires, 11.2-24 rear tires, 9 forward and 3 reverse-speed transmission, only 583 original one-owner hours, always shedded. Serviced through shop and needs nothing. Have owner's manual. 1938 John Deere B General Purpose unstyled tractor, 540 PTO, like-new Goodyear 500X15 4 ply 3 rib front tires, like-new Goodyear 11.2X36 4 ply rear tires, flywheel start. Very sharp, like-new older restoration. 1985 Ford 3910 3 cylinder LP gas tractor. Can be converted to regular gas (has the original factory fuel tank). Power steering, 8-speed transmission, independent 540 PTO, lights, differential lock, 13.6X28 6-ply Firestone diamond tread tires @ 95%+ tread, 750X18 6-ply Firestone three-rib front tires @ 95%+ tread, Clark-American/American Lincoln wet/dry auto scrubber, has 3 pt. rockshaft arms (missing the lift links, lower 3 pt. arms and top link). Showing 128 hours. 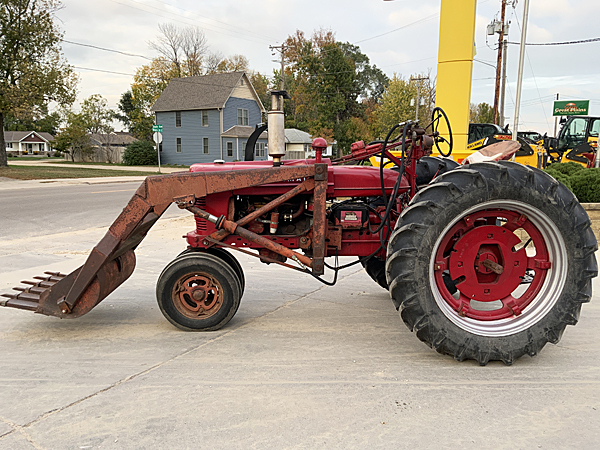 1964 Oliver 770 tractor, wide front axle, 540 live PTO, 13.6X38 rear tires, factory power steering, flat top rear fenders, one set rear remote valves, original lights. Serviced through shop. 1952 Allis Chalmers WD tractor, gas engine, Firestone 14.9X28 rear tires, rear wheel weights, power adjust rear wheels, lights, hand crank, converted to 12-volt with alternator. 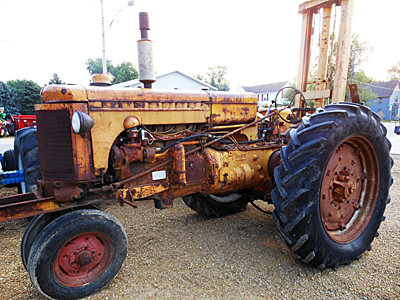 Sharp, clean tractor, excellent mechanical condition, has 3 pt. rock shaft with two cylinders. 1955 John Deere 70 2wd gas tractor, like-new 14.9X38 Firestone rear tires, wide front axle, factory 3 pt. hitch, 540 rear PTO, manual steering. Has tach but tach not working. Needs TLC. IH 400 tractor, gas engine, 14.9X38 rear tires, Schwartz wide front axle, three hydraulic remote valves, drawbar, 540 independent PTO, torque, power steering. Minneapolis Moline U tractor, narrow front, with mounted forklift mast. Minneapolis Moline U tractor, narrow front axle, 13-38 rear tires, converted to 12 volt, power steering, rear wheel weights, hydraulic system with one rear remote valve. One-owner tractor; Werner Implement sold it new. This tractor has a one-piece cylinder head.